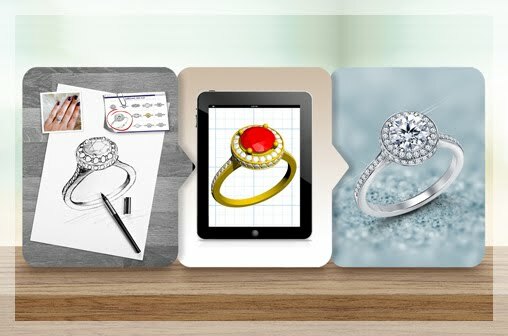 So, you know all about the 4Cs and you did your research on lab grading reports (sometimes called certification) – are you ready to buy the engagement ring? Now for one last step. You have to understand ring settings and styles. When making this very important decision, you need to know your bride-to-be's sense of personal style. If you have paid attention to her you may have heard terms like ‘solitaire’ or 'cathedral' or ‘halo.’ It’s a good idea to know what these styles and settings look like to make the right choice. Insider Tip: Check her Pinterest or other social media pages often. If she is thinking about marriage, there is a good chance she is showing others (and you) exactly what she wants. What is a ring setting? The setting is about how diamonds or other gemstones are 'set' or placed on a ring. The type of setting you choose is important because different settings affect the way diamonds look on a ring. What is a ring style? Ring style refers to the overall design of the ring, such as, a solitaire ring. Let's take a look at some of the popular settings and styles. This a prong setting without the diamond in it. This setting is also known as a peg head setting. The peg is soldered onto the shank of the ring. It is a popular settings due to the clean look and simple design. 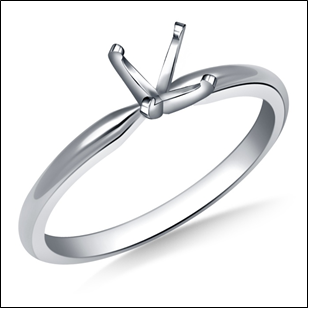 Four prongs or six prongs are quite commonly used to secure the diamond. The major advantage of this setting is that the diamond is the star of the show. The light enters from all sides, allowing the diamond to really sparkle. The one drawback of this setting is that the prongs can become bent or loose over time making the diamond less secure, though it is very rare that a diamond ever becomes dislodged. 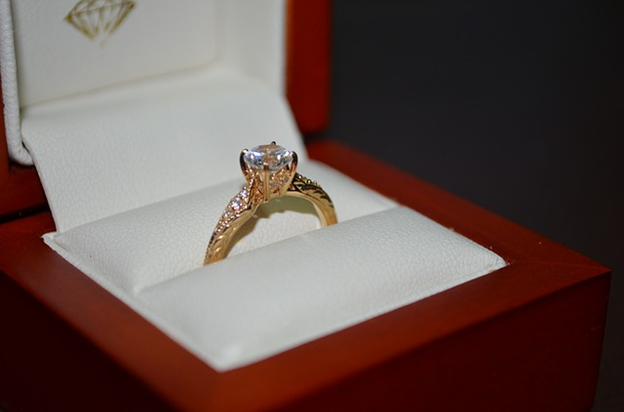 If you choose this setting, be sure to bring your ring to a professional jeweler for checks every six months. 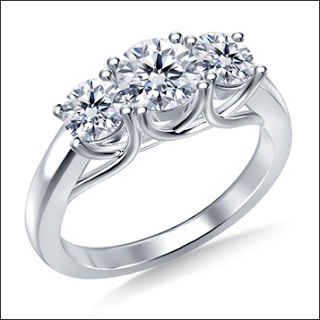 This is called a basket setting and it resembles a basket with thin bars on all four sides securing the center diamond. This setting also allows the diamond to shine brilliantly as light passes through the stone on all sides. 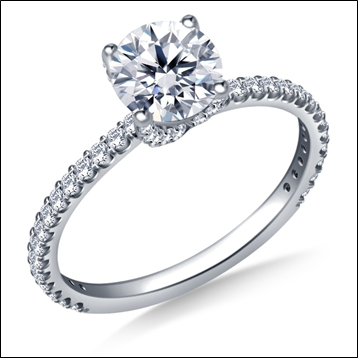 The halo setting is one of the most popular settings for engagement rings. 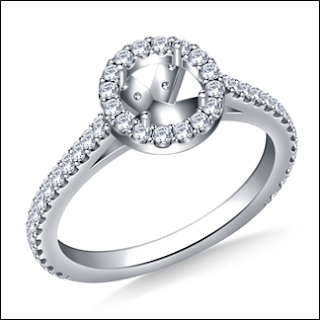 The center diamond is completely encircled by a 'halo' of smaller accent stones. Halo rings often have accent stones on the shank, like the ring above, but you can choose one without the accent stones. Insider Tip: The concentric ring of smaller accent stones around the center diamond can make it appear larger and enhance its brilliance. So, you can have a halo ring customized with a smaller center diamond, like a 0.90 ct. one, and it may appear similar to 1.0 ct stone. This is an affordable and beautiful way to enhance the size and brilliance of your stone. 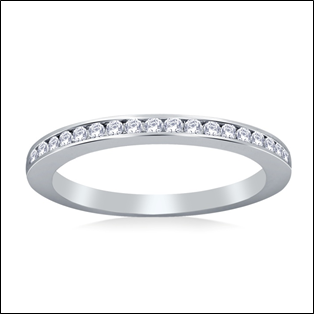 The halo ring is available in range of styles, like the square halo ring below or the double halo ring. 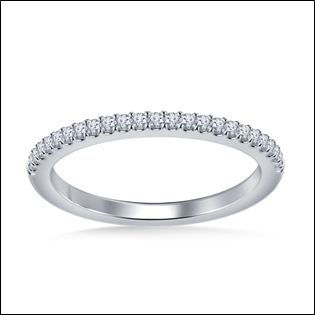 In a bezel setting, the center stone is fully surrounded by your choice of gold or platinum. While the setting is quite secure as it is fully surrounded, it doesn't allow as much light to pass through as a prong-style setting. A lot of engagement rings incorporate accent stones. 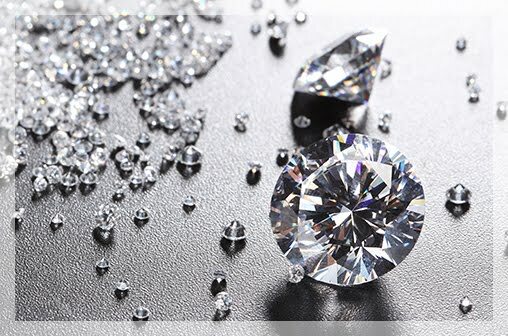 They are smaller stones, about .015 to 0.18 ct. in weight, that complement the center diamond. These stones have different setting styles, one of the most popular being the channel setting. In this particular setting, the stones are embedded between two parallel walls of metal. The sparkling row of gems looks quite beautiful when paired with the shining center diamond. Pronounced “Pah-vay”, the accent gemstones are set closely together by small beads of metal. 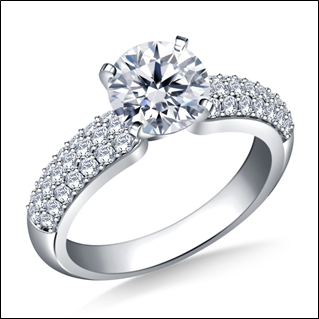 This setting is quite popular because it looks like the ring shank is encrusted with diamonds. In a shared prong setting, adjacent diamonds share metal prongs, hence the name. This setting allows more light to pass through than a channel set diamond, giving the accent diamonds more brilliance and fire. In this type of setting, the accent stones are held together in place by parallel, vertical bars. It is often used for baguette and other rectangular stones. A ring style may have different settings. 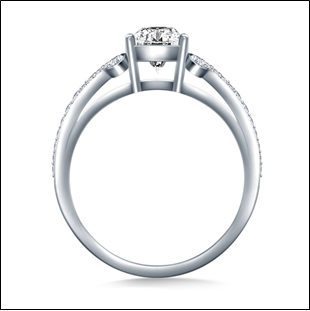 This is a classic solitaire ring where the diamond is set in a prong setting. 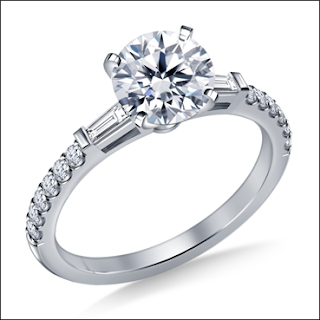 This ring style is one of the most favored – the classic engagement ring. It features one sparkling center diamond. With the solitaire ring, it's all about the diamond. 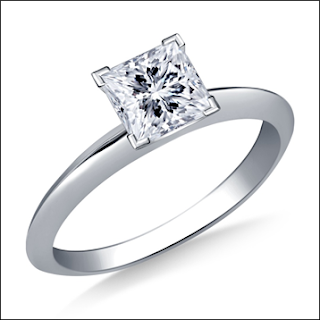 If you go for this particular style – get the best diamond you can. In this style, both sides of the center stone are adorned with a row of sparkling accent stones. The center diamond can be set with prongs or it can be a halo setting. The side stones can also be set with different techniques: shared prong, pave and channel are quite popular. This style is also a classic when it comes to engagement rings. 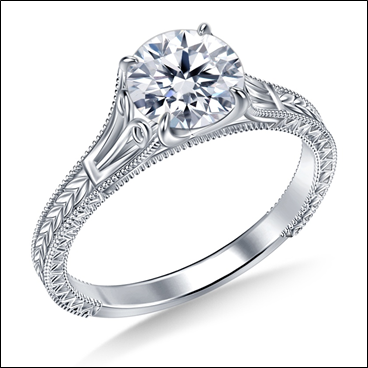 This style is not quite as common as the side stone and solitaire but it has a beautiful symbolic meaning. The side stones are said to represent the past and the future while the center diamond represents your present. Insider Tip: Often times you can use other gemstones, like sapphires, for the two smaller stones if your future bride likes a little color. How Do You Choose the Engagement Ring? Now that you know how the different styles and settings look – how do you buy the perfect engagement ring? 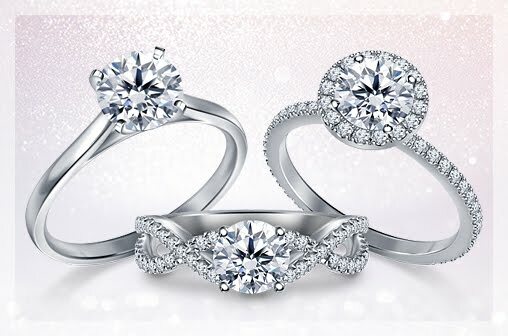 How do you choose a ring that she will love? You spy! Hopefully you have picked up clues from her Pinterest board and other social media platforms. Take a moment to look through her stash of fashion magazines, noticing if she has anything circled or bent any ‘dog-eared’ pages. She may have also dropped some hints, so keep those in mind. Ask her friends, sisters or her mother about any particular style she may have talked about. Also be intuitive about her style, take a look at your partner's current wardrobe and accessories. Does she follow a specific style? Us her and her preferences as your guide. Does your girlfriend love hunting for unique things through estate sales and antique stores? Then, she may fall in love with a vintage-style ring. As the name suggests, these rings are inspired by Georgian or Victorian era jewelry. Often, they will have milgrain detailing on the shank. Milgrain is the tiny bead shapes you see placed right at the edges of the ring. Vintage rings may have engraved shanks, like the one above. These rings have a definite romantic appeal to them. Another hint? If your future bride loves Jane Austen novels, this may be the ring to woo her. Lovers of vintage clothing and beautiful antiques often times appreciate vintage-style rings. Is your girlfriend's apartment filled with modern, angular furniture, dark colors and chic accessories? A ring, like the one above, may be for her. It has a princess diamond with angular prongs securing it to the ring and a tapered, knife-edge band. Does your girlfriend wear beautifully-tailored suits to work? Does she love a beautifully set table when friends are over? She may love classic styling. This ring has a beautiful solitaire accented by smaller diamonds on both sides. First of all, it came from you – so she has an emotional attachment. But if it’s not quite what she hoped for, don't worry, it can fixed! Encourage her to be open and honest with you and find out what it is, exactly, that she doesn't like about the ring. Since you've done your homework about the diamond, most times, it is simply the style or setting that troubles her. The setting and style can be changed. The metal – platinum, white gold, rose or yellow gold can also be changed. 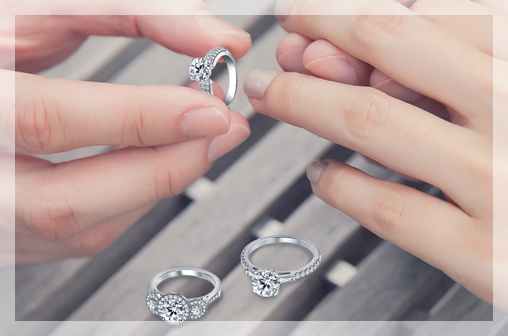 Be sure, to choose a jewelry retailer that will let you return or exchange the ring. How can I get the most bang for the buck?! Shopping online is a great way to make sure you get an amazing deal. Most online retailers have a 'no-questions-asked' return policy. At B2C Jewels, we have a 'try it for free' service where we send our customers up to 3 replicas to try at home, before deciding on one. 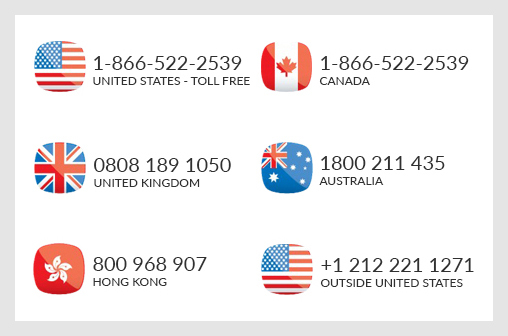 With this information, coupled with our Insider tips, you can confidently buy a beautiful engagement ring. Buy the right diamond accompanied by the right ring, and look forward to spending your life together.